Tip 44: Be Really Selfish By Refusing to Cook Animals for People | Weird! Why Aren't You Vegan? Since it’s not illegal yet, people can make the choice to eat animals. And freedom of choice is good. But not in your house, and not in your frying pan, baby! Your house is your castle, your refuge, your safe zone. Your home is the only place where you’re in charge and nobody can make you do anything you don’t want to do. Like make disgusting meat-eating dinner guests feel too welcomed. If Uncle Jethro wants to come to dinner at your house, he’s going to have to be okay with skipping meat for one meal of his entire life. Vegans and wannabe vegans, Uncle Jethro will have to do this soul-searching on his own. It’s not for you to worry about. You just be a good vegan and force all your dinner guests to endure the horror of eating dishes like Island Black Bean Burgers, Pesto Risotto, Nirvana Enchilada Casserole, and Peachy Raspberry Cobbler. * Poor, poor Uncle Jethro. Muahaha! You get all the good of having company and none of the bad: a dinner guest is a great excuse to make something wonderful and intricate for dinner, so take advantage of it. But don’t worry at all about making something they will like. 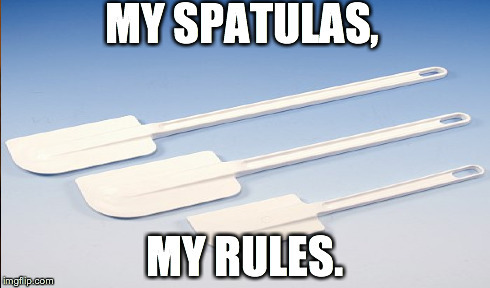 Your spatulas, your rules. You won’t have to go against your values by agreeing to put your dinner guests’ selfishness above your own. If one person’s selfishness is based on well thought-out ethical decisions, it totally trumps the other person’s selfishness based on tradition and social norms. You can use this as a gateway into other things, like playing whatever kind of music you want in your home, wearing whatever you want in your home, talking however you like in your home, and more! Uncle Jethro might not come to dinner again. Not really a challenge. Moving on. Your guests might like the meal and eat it all. Or even their share of it. Dang it. No leftovers for you.